Heading into the final stretch of the holiday shopping season, Walmart, Target, and Best Buy retained the highest consumer Ad Awareness of major retailers from one year ago, according to YouGov BrandIndex. Like last year, several brands saw their Ad Awareness scores drop from this time last year. 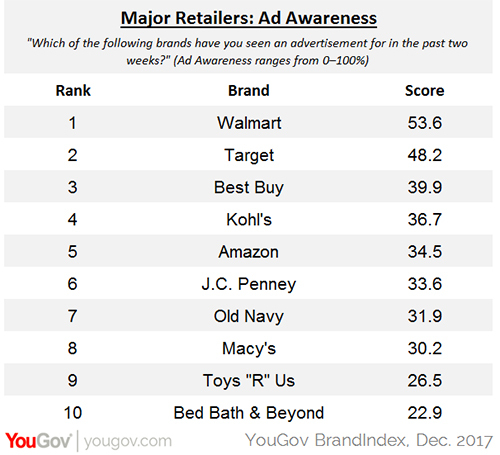 But Walmart, Target, and Best Buy managed to add a small amount to their Ad Awareness scores since December 2016. This year, 54% of all US adults have seen a Walmart ad in the past two weeks, followed by Target at 48%, and Best Buy at 40%. Kohl’s jumped two spots to take the fourth position at 37%. The top three chains also garner top spots in Value perception, sitting right behind e-tail giant Amazon in the number one spot. As a matter of fact, Walmart is the only major national retailer to have a statistically significant gain in Value compared to one year ago. The remainder of the top retailers remained statistically stagnant in their Value perception compared to December 2016. Despite the apparently successful marketing of this top group, a handful of retailers are seeing less awareness of their ads at this crucial time. Repeating the same trend as last December, those stores include Macy’s, Toys “R” Us, Sears, Kmart, Neiman Marcus, and Bloomingdale’s. According to additional data from YouGov Profiles, 77% of consumers say they always look for the lowest prices when doing their shopping. Meanwhile, 45% of US adults admit that advertising helps them choose what to buy. YouGov BrandIndex measured major holiday retailers using two metrics: 1) Ad Awareness, which asks respondents "Which of the following brands have you seen an advertisement for in the past two weeks?" A score can range from zero to 100%. 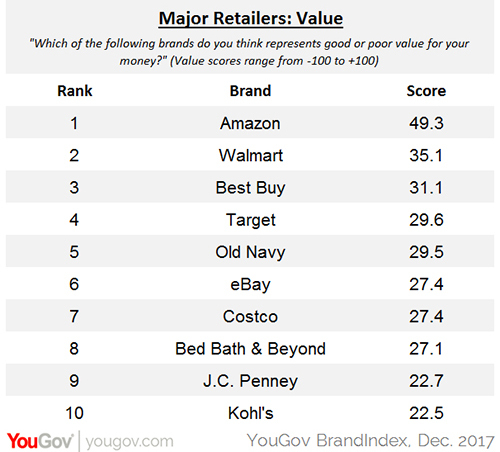 2) Value, which asks respondents “Which of the following brands do you think represents good or poor value for money?” A score can range from -100 to 100, with a zero score equaling a neutral position.